Goals from Len Doungel, Kim Song Yong, Sunil Chhetri, Alwyn George and CK Vineeth saw Bengaluru FC produce a dominant second half display to overcome a 1-0 deficit and register a 5-2 win over the India under-19 team in the second pre-season friendly between the two sides at the Bangalore Football Stadium, on Wednesday. The Blues had beaten the under-19s with an identical scoreline at the same venue on Saturday. The U19 side took the lead in the 37th minute and against the run of play with a deflected shot from Vinit Rai finding the net. 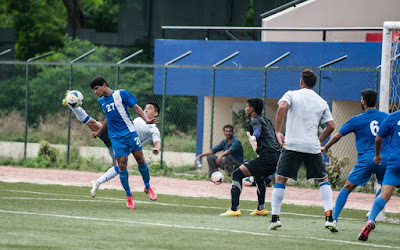 Bengaluru’s best chance of the half came when Chhetri’s header from a Beikhokhei Beingaichho cross was tipped away by U19 ’keeper Sukhdev Patil. Ashley Westwood rung in three changes at half time, sending on Doungel, Kim and George to add to the Blues’ attack. It didn’t take long for the substitutes to have their say with Doungel slotting home five minutes from the hour mark. A volleyed effort from Kim saw the North Korean grab his first goal for the club, giving Westwood’s men the lead just a minute later. A calm run and finish from Chhetri saw him grab his second in as many pre-season games in the 66th minute. The under-19s reduced the deficit with Lalhlimpuia, who collected a cross from the left and found the net from close to make it 3-2. Despite the Indian Colts’ best efforts to equalize, Alwyn George rose high to head home a parry by Patil to restore the Blues’ two goal advantage. CK Vineeth then became the Blues’ fourth substitute to score on the day when he collected a pass from George to slot home and make it 5-2 to the Blues.